In this week's episode of ROAD TRIP, Mark Fulmer accompanies BMW's Tom Plucinsky, Stephan Durach and Martina Starke in a drive from downtown San Diego to Apple Valley and back in the new 2009 7 Series sedan. The launch of the new BMW 7 Series heralds the arrival of a host of world-first driver and passenger-focused technologies. As the world’s best selling luxury car, the four previous generations of BMW 7 Series have consistently offered the highest levels of technology, with the first 750i of 1987 famously offering more computing power than NASA utilised to put man on the moon. 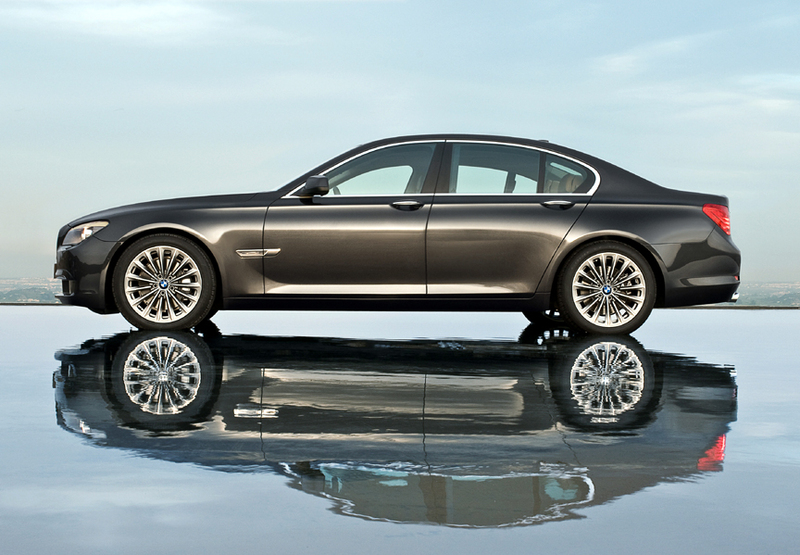 Now the latest BMW 7 Series has raised the technological benchmark again. As a world first in the new, fifth generation BMW 7 Series, Speed Limit Display comes as standard with the optional Lane Departure Warning system. Using a camera mounted behind the rear view mirror, the system cross-references the GPS navigation system information and the real-world information to constantly monitor the legal speed limit, and relays this information to the driver in the dashboard or, if specified, into the Head-up Display. The car’s hard drive is pre-programmed with all of Europe’s speed limits but, in the case of road works or incidents, limits can vary. The camera reads the numbers on temporary road signs and over-rides the known speed limit, bringing this information constantly into the driver’s line of sight. Night Vision is a familiar BMW technology that has been advanced and adapted for the new BMW 7 Series. BMW was the first to bring a Night Vision system to market but the new 7 Series also features another world first - Pedestrian Recognition. Scanning the road up to 300 metres ahead, much further than even the most powerful xenon headlamps, Night Vision highlights the shape and proximity of any heat sources that are close to the predicted path of the car. With Individual Pedestrian Recognition, the system uses video data and complex algorithms to predict if any pedestrians are behaving abnormally and are likely to move into the path of the car. The driver is alerted by warning symbols in the control display or the Head-up Display if specified. BMW’s Lane Departure Warning system uses the same camera as the Speed Limit Display but this time, monitors the white lines on the road ahead. If it notices the car deviating out of lane without the driver indicating, they are notified by a vibrating steering wheel. This familiar system can be complemented on the new 7 Series by BMW’s new Lane Change Warning. 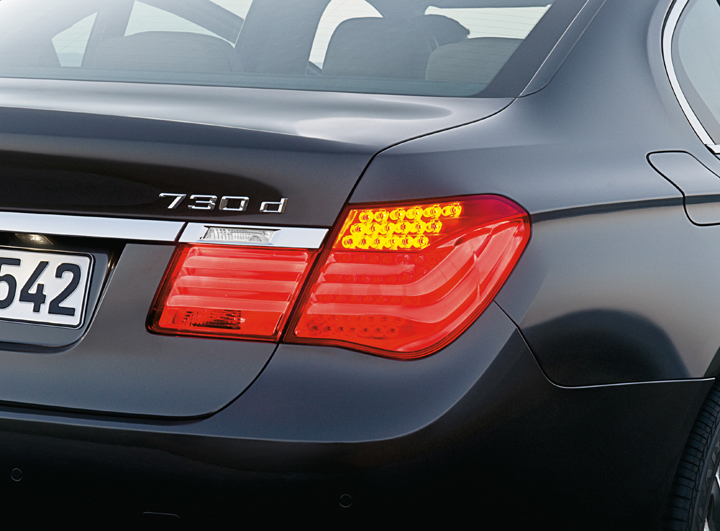 Two sensors in the rear bumper monitor the blind spots to either side of the 7 Series. When they detect a car that may be out of the direct view of the driver and the indicator is activated, an orange warning triangle illuminates in the door mirror to warn of the danger lurking in the driver’s blind spot. If this is ignored, a steering wheel vibration acts as a further warning. Side view cameras are a BMW first and are available as an option working alongside the standard Park Distance Control and optional Reversing Assist Camera. Using cameras mounted in the front bumper, the driver can see around obstacles or pull out of difficult junctions with confidence. Activated using a button in the centre console, the driver is presented with a split-screen view of both directions in the iDrive display. 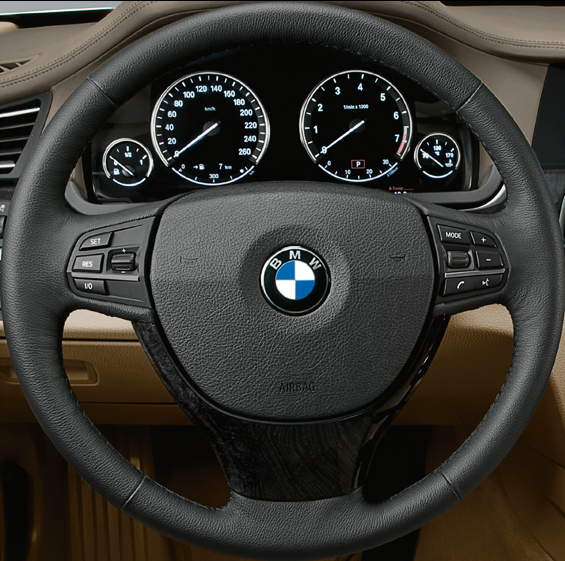 Finally, BMW is the first premium manufacturer to offer Integral Active Steering (IAS) – effectively four wheel steering. IAS offers more direct steering responses and a smaller turning circle at slower speeds while, at higher speeds, delivers a more composed ride.